Swachh Bharat Online Citizen Communities were initiated in October 2014 by LocalCircles (www.localcircles.com) and Swachh Bharat Mission, Ministry of Urban Development in October, 2014. Since then, over 355,000 citizens have become part of the various Swachh Bharat citizen communities across more than 60 cities of India. The National Community called “Swachh Bharat” enables Swachh Bharat Mission to easily seek collective citizen inputs on various aspects of Swachh Bharat policy and state of things in real time. 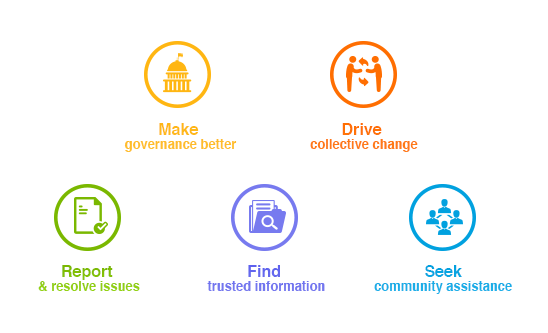 Based on collective citizen inputs, hundreds of whitepapers/checklists have been generated in the last three years. 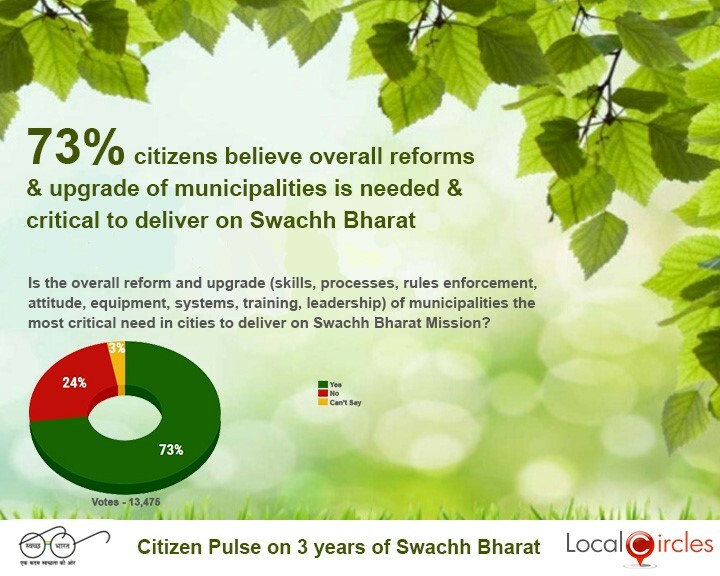 These cover subjects like Municipal Reforms to Civic Sense Basics for every Indian, engaging citizens in every aspect of Swachh Bharat policy making. The national survey on three years of Swachh Bharat was conducted in the Swachh Bharat National Circle to gauge the impact and performance of Swachh Bharat in a transparent manner. The objective was to understand what’s working and where efforts need to be put in going forward. More than 115,000 votes were polled in the survey, making it the largest civic survey of its kind. Approximately 62% of respondents were males while 38% were females. The participants were 42% from Tier 1 cities, 30% from Tier 2 cities and 28% from Tier 3 Cities and Rural areas. 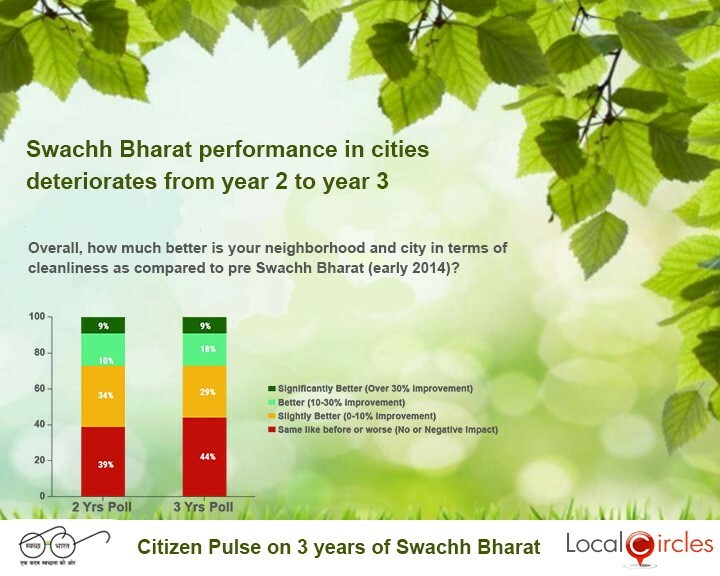 Overall, Swachh Bharat is now showing its positive impact in urban India. The big positives from this year’s national survey is that 32% citizens believe that Swachh Bharat is having a positive impact on children. The second big positive is that 32% citizens feel that civic sense has improved due to Swachh Bharat in the last 3 years. 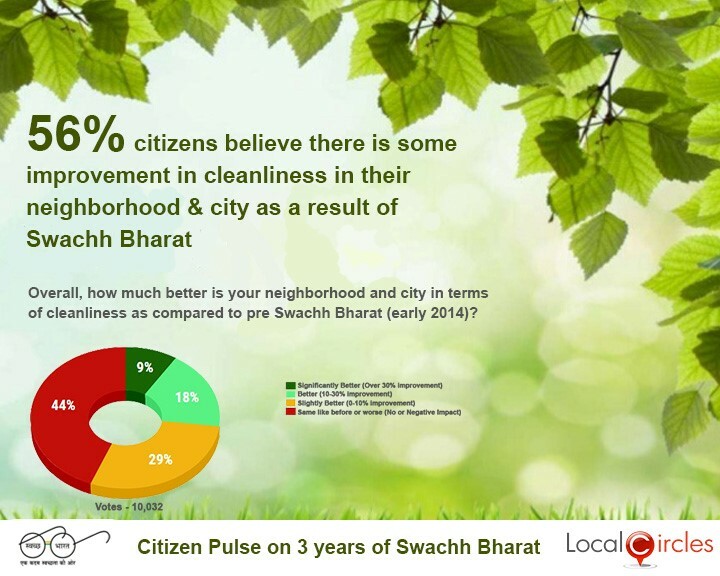 Neighbourhood and city is cleaner than what it was pre-Swachh Bharat. 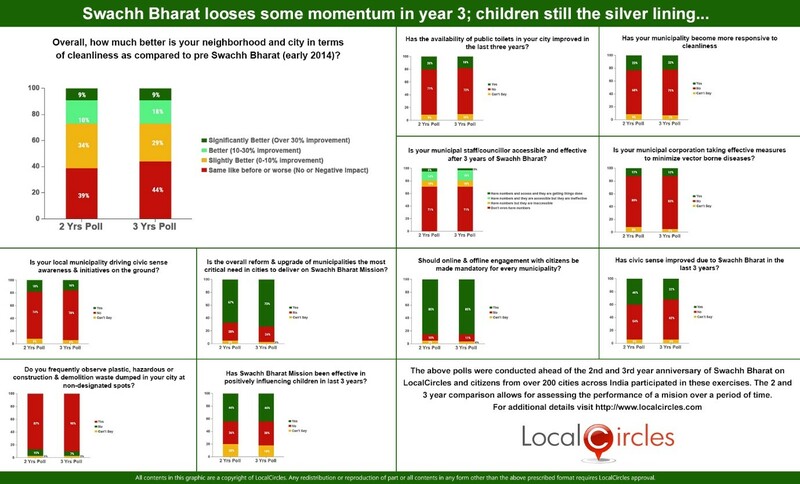 However, the biggest area requiring immediate focus according to the citizens is the municipalities. 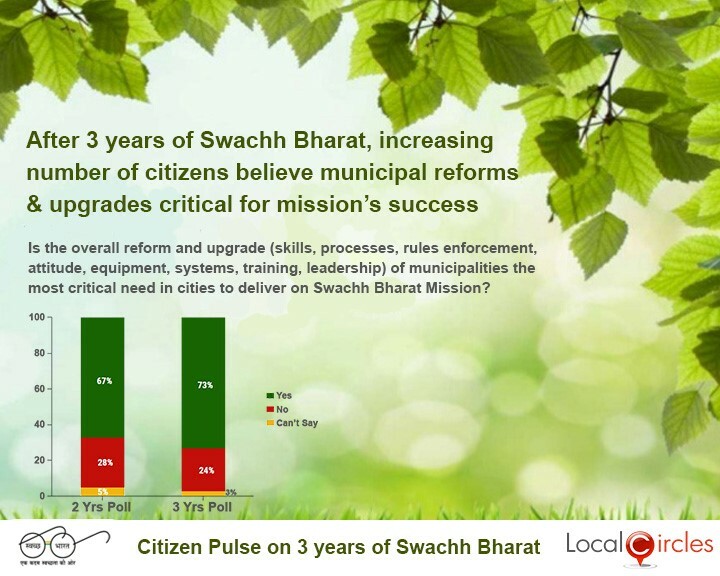 The municipalities, according to citizens are not working in parallel to Swachh Bharat and are largely disengaged from the mission. As per citizens, poor municipal enforcement, lack of processes/systems, corruption, delays, responsiveness of municipalities and lack of accountability are issues that until effectively addressed will continue to be a bottleneck in the long-term success of Swachh Bharat. 44% citizens this year feel that there has been no improvement in cleanliness in their city due to the Swachh Bharat Mission, compared to 39% who said the same last year showing a deterioration in the level of cleanliness. The survey to check the impact of the Swachh Bharat Mission was also conducted in various state level circles on LocalCircles. 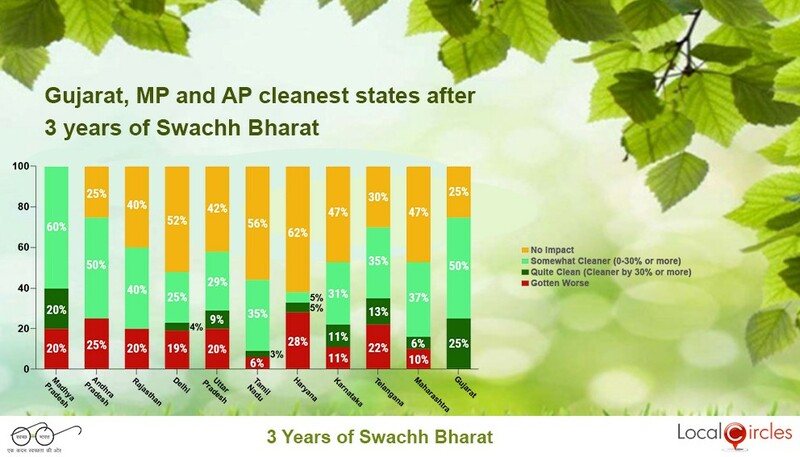 The results showed that Gujarat, Madhya Pradesh and Andhra Pradesh are the cleanest states after 3 years of Swachh Bharat. 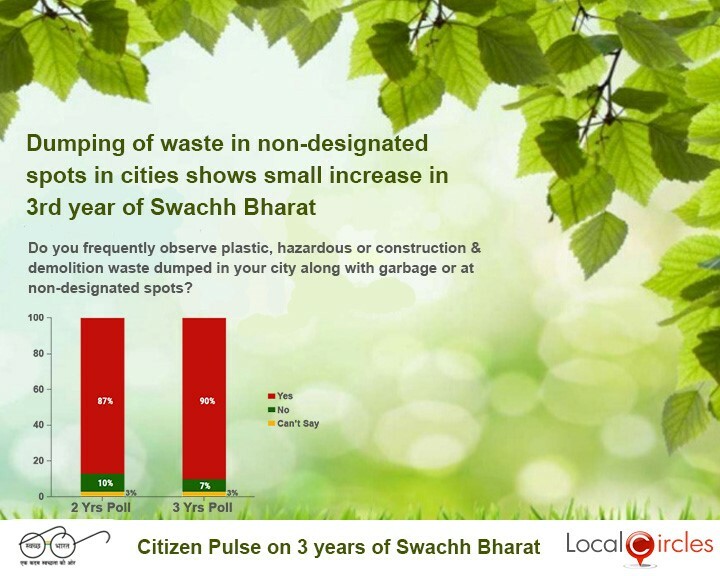 The results also showed that a large number of citizens in the states of Karnataka, Maharashtra, Uttar Pradesh and Rajasthan feel that their city is cleaner due to the impact of Swachh Bharat in the last 3 years. 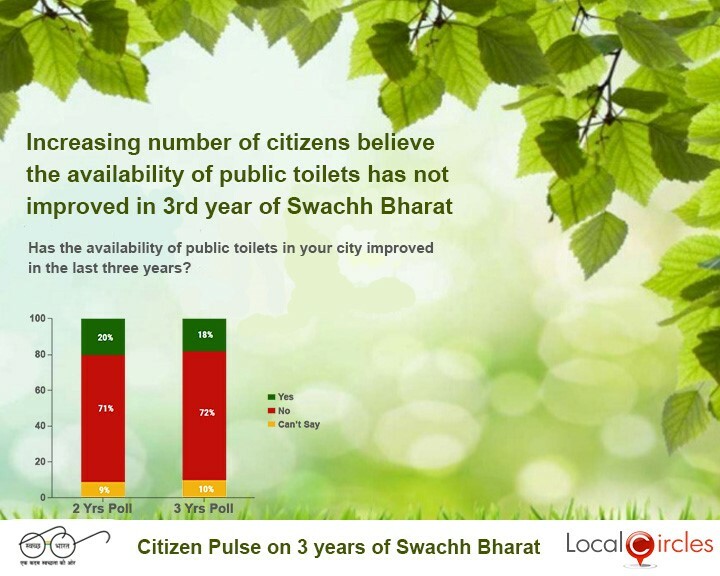 On the other hand, majority of citizens from the states of Delhi, Haryana, Tamil Nadu and Telangana felt that there has been no impact of the Swachh Bharat Mission in their states and the cleanliness condition are either same as earlier or have even deteriorated. 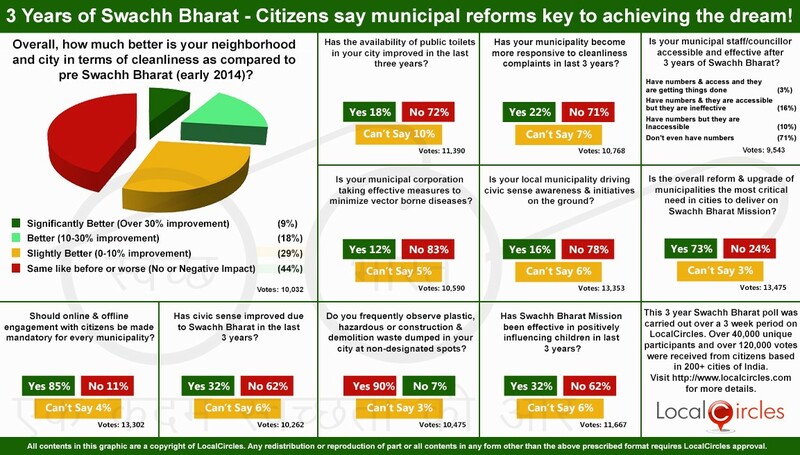 Further details of the state level Swachh Bharat surveys are given below. 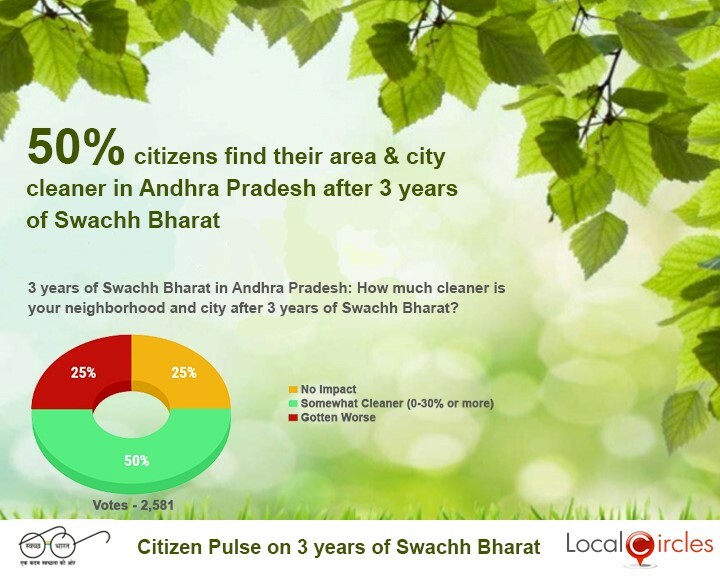 50% citizens find their area & city cleaner in Andhra Pradesh after completing 3 years of Swachh Bharat Abhiyan. 52% citizens see no impact in their area & city in Delhi after completing 3 years of Swachh Bharat Abhiyan. 75% citizens find their area & city cleaner in Gujarat after completing 3 years of Swachh Bharat Abhiyan. 62% citizens see no impact in their area & city in Haryana after completing 3 years of Swachh Bharat Abhiyan. 42% citizens find their area & city cleaner in Karnataka after completing 3 years of Swachh Bharat Abhiyan. 80% citizens find their area & city cleaner in Madhya Pradesh after completing 3 years of Swachh Bharat Abhiyan. 43% citizens find their area & city cleaner in Maharashtra after completing 3 years of Swachh Bharat Abhiyan. 40% citizens find their area & city cleaner in Rajasthan after completing 3 years of Swachh Bharat Abhiyan. 56% citizens see no impact in their area & city in Tamil Nadu after completing 3 years of Swachh Bharat Abhiyan. 48% citizens find their area & city cleaner in Telangana after completing 3 years of Swachh Bharat Abhiyan. 62% citizens see no impact in their area & city in Uttar Pradesh (UP) after completing 3 years of Swachh Bharat Abhiyan. 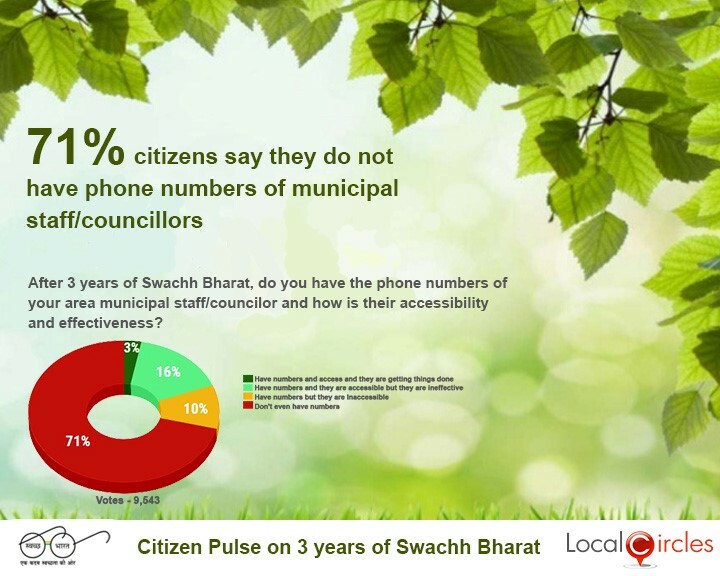 Swachh Bharat Online Citizen Communities are now available in over 150 cities of India. These communities allow citizens in these cities to get and stay connected for the cause of Swachh Bharat. 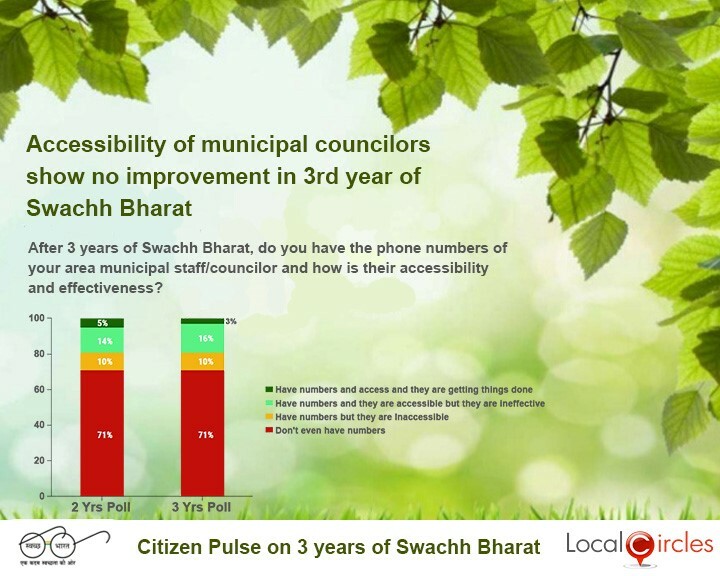 The urban local bodies of these cities can access their respective city community to seek citizen inputs, run surveys, organize events like cleanliness drives, citizen feedback sessions etc on fingertips. These communities started by LocalCircles (www.localcircles.com) and Swachh Bharat Mission, Ministry of Urban Development in October 2014 promote participative governance in its truest sense.